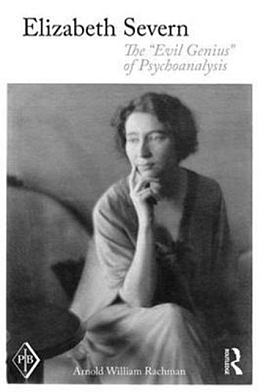 Elizabeth Severn: The ‘Evil Genius’ of Psychoanalysis chronicles the life and work of Elizabeth Severn, both as one of the most controversial analysands in the history of psychoanalysis, and as a psychoanalyst in her own right. Condemned by Freud as "an evil genius", Freud disapproved of Severn’s work and had her influence expelled from the psychoanalytic mainstream. In this book, Rachman draws on years of research into Severn to present a much needed reappraisal of her life and work, as well as her contribution to modern psychoanalysis. Arnold Rachman’s re-discovery, restoration and analysis of the Elizabeth Severn Papers – including previously unpublished interviews, books, brochures and photographs – suggests that, far from a failure, that the analysis of Severn by Ferenczi constitutes one of the great cases in psychoanalysis, one that was responsible a new theory and methodology for the study and treatment of trauma disorder, in which Severn played a pioneering role. Elizabeth Severn should be of interest to any psychoanalyst looking to glean fresh light on Severn’s progressive views on clinical empathy, self-disclosure, countertransference analysis, intersubjectivity and the origins of relational analysis. Intrigue, betrayal, and seduction - the plotline of novels and mysteries – happens in real life too. A favorite son goes against his honored father’s teachings. Is he creating a new innovative vision? Or, is he being led astray by the seduction of an evil genius? A great storyline but what if the favorite son is Ferenczi? And the honored father Freud? And the presumed seductress Elizabeth Severn? What did and does psychoanalysis do with this dissonance in a science and a therapeutic endeavor sensitive to criticism and rejection? Rachmann’s wonderful book traces the hide and seek of the tale – the hiding of Severn’s identity, her and Ferenczi’s influence on the field, and her remarkable life and wisdom. All of this intertwined with multiple movements within psychoanalysis attempting to explore trauma and regression, intersubjectivity and the inevitable personal involvement of the analyst in the doings, understandings, misunderstandings, ambience, and mutual growth that emerges in both analysand and analyst in a successful clinical experience. Psychoanalysts, historians, and interested readers will all find much to learn and be intrigued by in Rachmann’s telling of his tale of seeking and finding Elizabeth Severn: The Evil Genius of Psychoanalysis. With the typically courageus attitude of the pioneer, Arnold Rachmann adds with this new volume another great piece in the puzzle of the reconstruction of the real story of psychoanalysis, not only what has been accepted and acknowledged but also what has remained unseen, unheard because silenced: the voice of Elizabeth Severn, one of the most important cases analysed by Sandor Ferenczi in his Clinical Diary. Himself a silenced voice because of his revolutionary treatment of severely abused patients, opposed by Freud who had abandoned the "seduction theory" for a fantasied version of it, Ferenczi has started receiving the due attention only in the last decades, at the end of the eighties, after the Diary has been published in English. With the precision and the acumen of the historian and the passion of the inspired detective and the spirit of the true searcher of truth (or I would say "witness"), Rachman has devoted over 10 years of research on the traces of Severn and his long-awaited findings are indeed a precious legacy: Through unknown material that appears here for the first time, the Severn Papers and the interview to Severn by Kurt Eisser, the figure of Severn as a pioneer psychoanalyst and one of the true heir of Ferenczi is finally reconstructed and rehabilitated. This is a book that is going to change the history of psychoanalysis and of trauma theory, restituting the right place to unjustly marginalised women psychoanalysts (with Severn also Clara Thomson and Izette De Forest): a must read not only for whoever is interested in the foundation of the Budapest School of Psychoanalysis (see Rachman ed. 2016) but for whoever cares for a kind of therapy and human research that is a form of passionate testimony based on mutuality, empathy and truth. "Arnold Rachman has been the heart and soul of the American psychoanalytic community, working to rediscover Sandor Ferenczi. He has been a meticulous historian, archivist and analyst of Ferenczi’s work. This book tells the story of the interlocking work and life and clinical encounters of Ferenczi and his patient Elizabeth Severn. In reviving Ferenczi’s reputation and work, he tells the story of Severn and mutual analysis as a inspired collaboration. In this volume we can trace the evolution one of the crucial developments in psychoanalysis: the role and potentiality of the analyst’s transference, countertransference and the intersubjective space in which psychic change may emerge." Chapter Eight: Psychoanalysis of Difficult Cases: Freud’s case of The Wolf Man and Ferenczi’s Case of R.N. Arnold William Rachman is a licensed psychologist, trained psychoanalyst, and Fellow of the American Group Psychotherapy Association.